To enjoy your vacation in our city, Giggly hostel offers you 2 stories with 28 unique rooms, featuring our own cafe on the last floor. 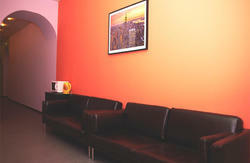 Our cozy common room with kitchen and plasma tv is a great way to mingle with other guests. In addition to that, feel free to have fun playing table games with your friends and to chill while having free cup of tea or coffee. Our friendly staff will be more than happy to give you any needed information and provide you with free city maps. Wi-fi is available and free of charge all over hostel along with public computer. In order to make your stay more comfortable, we are happy to provide you with public washing machines, free irons, ironing boards and hair dryers as well. Our security will be guarding your peace 24 hours. (early check ­in is subject to availability and needs to be discussed prior to arrival, ­early arrival from 6:00 am­15:00 is 50 % extra from a bed/room rate). (late check ­out is possible upon availability and needs to be discussed in advance, ­late check ­out between 12:00-18:00 is 50 % extra from a bed/room rate, after 18:00 is equal to one day of staying in hostel). Closest metro stations: Baltiyskaya and Tekhnologichesky Institut. From Baltiyskaya metro station: exit metro, cross Obvodny Kanal, follow Lermontovsky prospekt untill you reach intersection with Rizhskiy prospekt. Approximate time-10 minutes. From Tekhnologichesky Institut: exit metro, cross Moskovsky prospekt and follow Troitsky prospekt untill the intersection with Lermontovsky prospekt and then turn right untill the intersection with Rizhsky prospect. Approximate time-15 minutes. From Pulkov-1 Domestic airport : take public bus № 39 or K39 from airport to Moskovskaya metro station, then take blue line of the subway to reach Tekhnologichesky Institut, then use directions from Tekhnologichesky Institut. From Pulkovo-2 International airport: take public bus № 13 or K213, K13A from airport to Moskovskaya metro station then take blue line of the subway to reach Tekhnologichesky Institut, then use directions from Tekhnologichesky Institut. 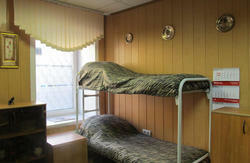 Minibus № K3 will take you directly to Tekhnologichesky Institut metro station. From Moskovsky railway station: take direct red line on a subway from Ploshad' Vosstaniya to reach Baltiyskaya metro station, and then use walking directions.